The Igloolik, Nunavut, collective Artcirq is a collaborative, community-based circus and multimedia company that has been creating work, engaging youth and performing around the globe since 1998. And that's not all! The arctic circus also makes music and has released two albums recently on iTunes. Co-founded by Isuma Productions and Guillaume Saladin, Artcirq blends techniques of modern circus like juggling and acrobatics with aspects of Inuit culture including drum dancing and throat singing. The group and work evolved from there. Members of Artcirq have performed in Timbuktu, Mali, Mexico, Greece and France. 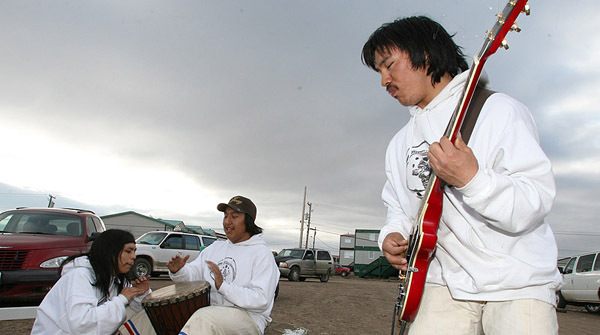 Six members were part of the Canadian Arctic performers representing Nunvut at the 2010 Olumpic Winter Games and this month, the group will travel to Windsor, England, to represent "The Americas" in the Queen's Diamond Jubilee Pageant. Both Artcirq albums are available on CDBaby and iTunes. Music is just a part of what the group creates. This short doc is a great introduction to the breadth of the work of Artcirq. I love co-founder Guillaume Saladin's definition of circus in it. He says "circus is a pretext - a pretext to create a circle of trust, a space where people can communicate with each other, an area where you can work on yourself, trust the other, and dream." Indeed it seems that in its 14 years so far, the group has maintained this practice of creative, communicative, and collaborative process. From the heartbreak of a community's loss, to the empowerment of movement, music and exploration, their work continues to inspire, represent, delight and move anyone it engages. Keep an eye out for more from Artcirq, and for additional video and music check out their Isuma channel at isuma.tv/hi/en/artcirq.